Spot the deliberate mistake : what is high-tech in this picture? 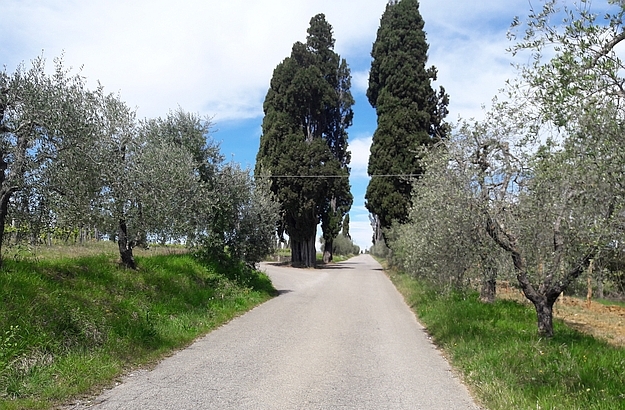 A dream come true: biking up and down the hills of the Chianti. You’ll be in for some big surprises along the countryside roads. Is there any better way to explore a region than to get on a bicycle? 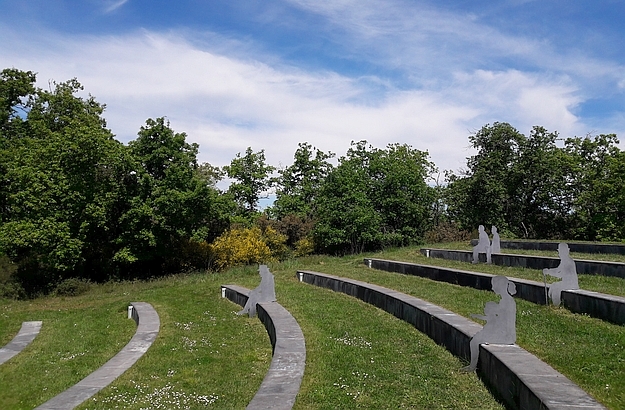 We stopped to have a shady stroll in the Chianti Sculpture Park. The lunch we had in Vagliagli was sooooo appetizing! I must admit that I quickly gave up on the idea – even though I have always thought that there is no better way to explore a place than by walking or cycling. For the Chianti is a pretty hilly patch of land!… up, down, up, down… So much so that there is an official bike race, the Eroica, which re-enacts those heroic times when cyclists had to tackle the rough bumpy dirt roads of the region on unsophisticated heavy-set bicycles. The kind of challenge I’m not ready to take up yet. 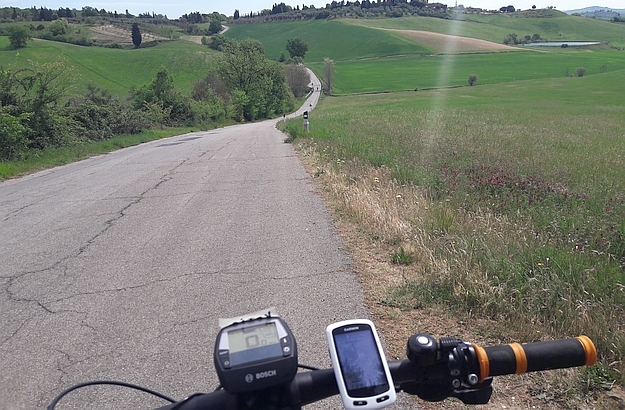 Fortunately, since I first arrived in Tuscany more than 20 years ago, the world has changed, the electric bicycle has been invented, and explorers can now ascend the Tuscan hills without courting exhaustion – an adventure which I finally tried a few months ago after renting an electrobike in a Siena shop. Massimiliano, the owner of the outlet, was kind enough to organize a tailor-made tour for our small party. We went from the town walls of Siena onto quiet countryside roads which ran along Tuscan vineyards and centuries-old olive groves. We also cycled past Renaissance gardens and beautiful Tuscan villas which I had never noticed before. 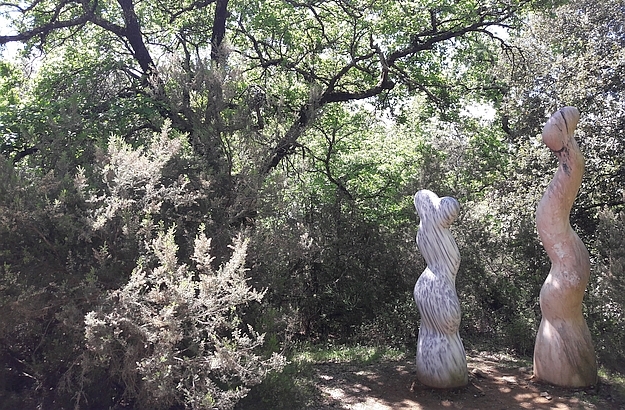 Then, at one point, we stopped to have a shady stroll through the lovely Chianti Sculpture Park. Finally, we hit the road again and headed for the medieval town of Vagliagli (whose name means “valley of garlic”), where we had a well-deserved lunch in the Taverna di Vagliagli. 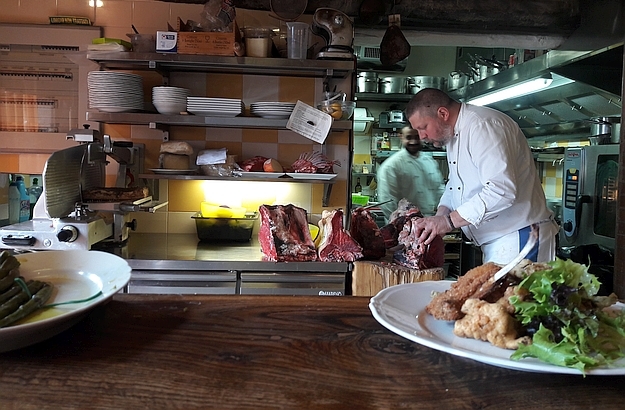 Accompanied with a fine glass of Chianti Classico, our typically Italian meal consisted of an antipasto (starter), a primo (first course) and a secondo (second course) – the latter was an extraordinary bistecca Fiorentina. 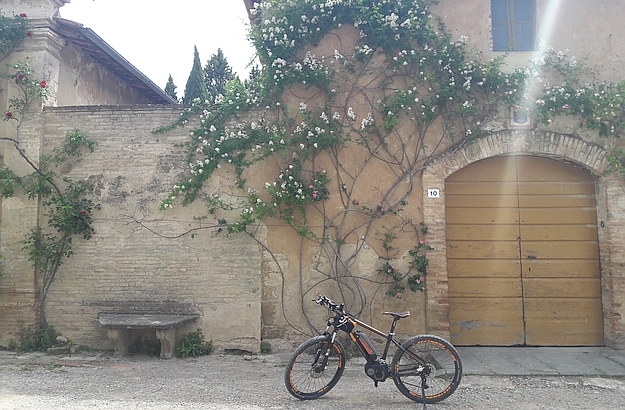 So, you’d like to try some electrobiking in the Chianti? Here is the link to Massimiliano’s bike shop in Siena. It rents all types of bicycles and supplies all the needed accessories, including helmets, GPS devices, etc. During the high season, I recommend that you should book in advance.